The SURFOX 204 weld cleaning system is our heavy duty workhorse that will keep you up and running through all three shifts while providing the most options to fit your ever-changing job requirements. 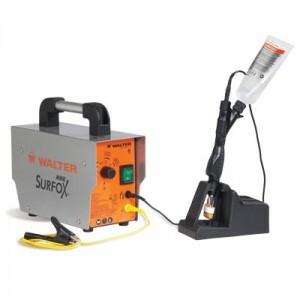 The SURFOX Mini is a compact and lightweight version of our SURFOX 204 weld cleaning system.With AC and DC mode capabilities, this unit will allow you to clean welds, mark, polish and etch stainless steel easily in the field. The SURFOX 304 is our new patented electrochemical cleaning system with a flowthrough system, which facilitates the cleaning of MIG, TIG and spot welds, without altering the surface of the parent material. The ergonomically designed MINI SURFOX is the most compact version of all the SURFOX machines. The machine has many important functional features built into a light and portable package which utilizes easy to carry liquid cartridges for dispensing the electrolyte solution. The MINI SURFOX machine is ideal for repairs, touch ups and small jobs. Opening hours : Monday to Friday, 9:00 A.M. to 6:00 P.M.